Zero Robotics 2018 Middle School Finals: Who Won? Students at the 2018 Zero Robotics Middle School Finals. 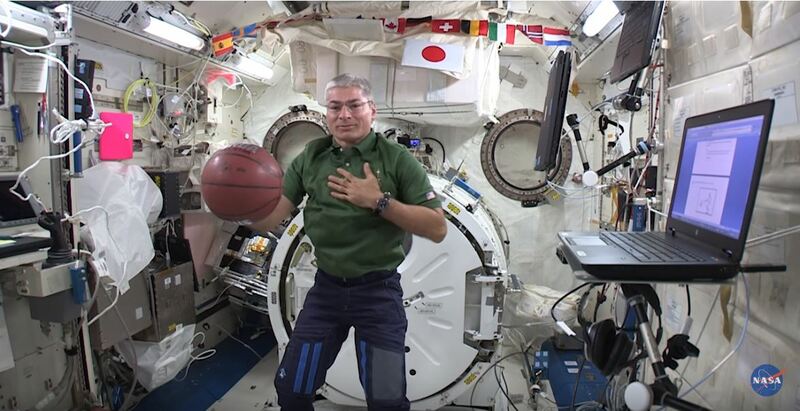 Onboard the International Space Station (ISS) last Friday, student-programmed SPHERES (Synchronized Position Engage Reorient Experimental Satellite) robots faced off in the Zero Robotics 2018 Middle School Finals. 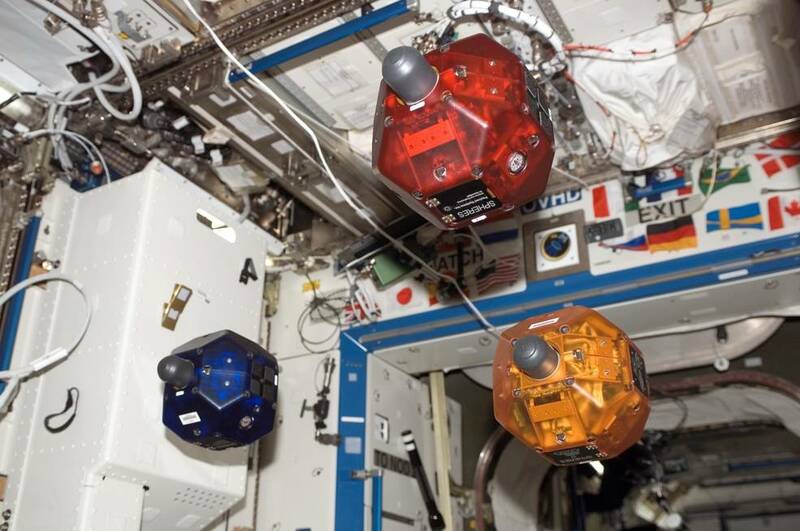 For each round of the tournament, two SPHERES robots competed against each other, running programs developed by student teams, and ISS crew members Ricky Arnold and Drew Feustel acted as referees. Three in-orbit SPHERES satellites fly in formation through the International Space Station. 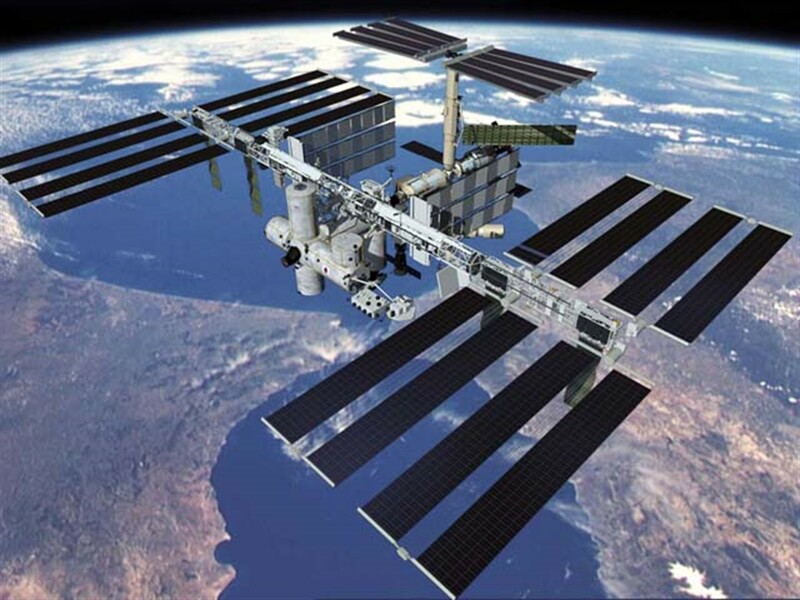 The participating students gathered in two locations—the Massachusetts Institute of Technology and NASA’s Kennedy Space Center Visitor Complex—to watch the live webcast from the ISS. Between rounds, student teams presented their strategies to their peers and mentors. This tournament was the culmination of a free five-week summer program run by Zero Robotics, a Space Station Explorers educational program. About 750 students and 130 educators participated in the middle school program this summer. A hands-on science, technology, engineering, and mathematics (STEM) curriculum introduced middle school students to computer programming, robotics, and space engineering. The student teams, which are typically connected with schools, camps, clubs, and other summer programs, signed up in May. Zero Robotics also operates a high school program during the fall semester. The “Zero” in Zero Robotics signifies that the program has zero cost, requires zero special equipment or experience, and uses zero-gravity robots. To reach the Middle School Finals, the student teams won a series of virtual competitions. At each level, the teams honed their programs to solve the challenge more efficiently. The robots had to perform autonomously; there was no remote control. The students couldn’t intervene while the robots carried out their coded choreography. This year’s challenge was called “LIFE-SPHERES,” where LIFE is a loose acronym for “Living-microorganisms Investigation of Enceladus.” Enceladus is an icy moon of Saturn known for its violent geysers that erupt from fissures near its south pole. The geysers hint at a vast liquid ocean beneath the solid surface. NASA is supporting research to look for possible microbial life in that subsurface ocean. The Zero Robotics program took this real-world NASA initiative and added some whimsical twists to give the students an extra challenge. 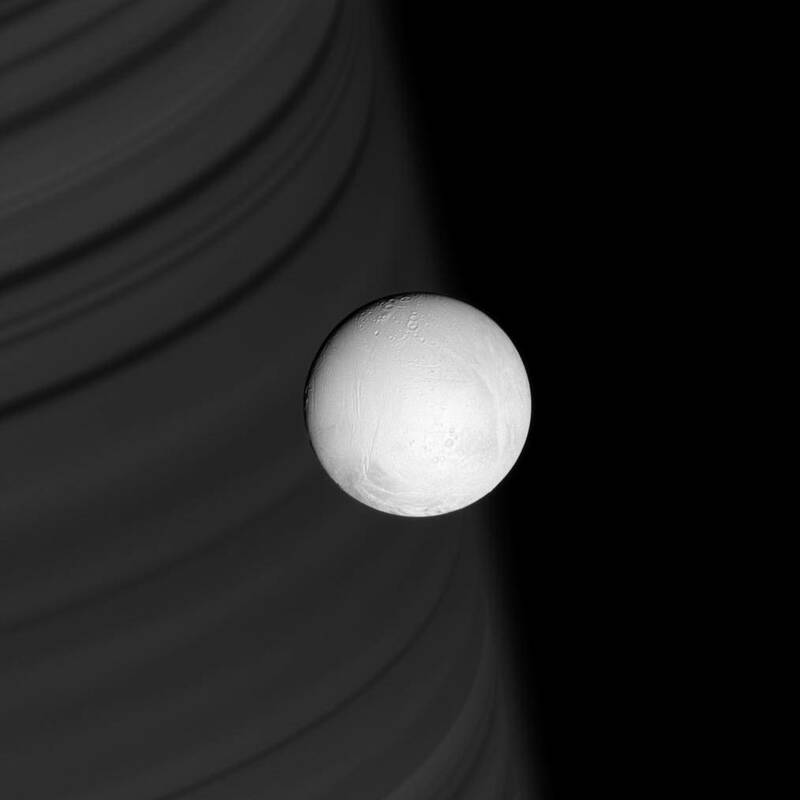 Ring shadows line the face of distant Saturn, providing a backdrop for the brilliant, white sphere of Enceladus. Here’s the scenario: A small spacecraft approaches the moon’s southern pole, drills a selected site to extract an ice sample, transports the sample to a base station, and then repeats this process. Not all locations have high-quality samples, so the spacecraft must target the best drilling sites. The goal is to collect as many ice samples as possible in a limited time. The spacecraft must be prepared to maneuver around sudden geyser eruptions that could send it tumbling off course. At the same time, a rival spacecraft is trying to interfere with these operations and steal the ice samples! To represent drilling the surface of Enceladus, the robots spun while maintaining a constant position in the air. Some teams found that their robots had great difficulty spinning in place. The students’ code had worked well in the simulated competitions, but those simulations may not have replicated all the details of the real-life conditions on the ISS, where the finals took place. In the end, this year’s winning student team was the Russia-Pennsylvania Alliance. In the final stages of the Zero Robotics tournament, student teams commonly join forces in multi-state and even international alliances. The teams combine their best strategies for programming the robots. 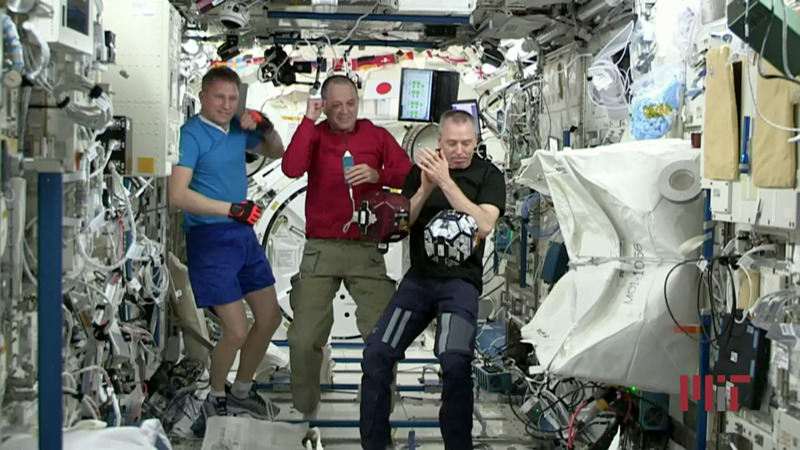 Alvar Saenz-Otero, who leads the SPHERES program and the Zero Robotics competition, commented that there is already a Russia-Pennsylvania alliance of sorts on the ISS: There are currently two Russian cosmonauts onboard, and one of the three NASA crew members—current ISS Commander Drew Feustel—is originally from Pennsylvania. 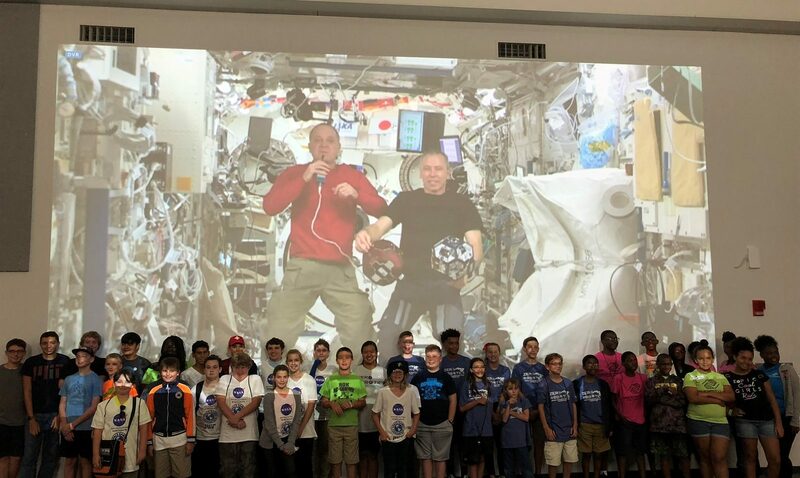 NASA astronauts Ricky Arnold and Drew Feustel and Cosmonaut Sergey Prokopyev congratulate the 2018 Zero Robotics Middle School Finals winning team from the ISS. Cosmonaut Sergey Prokopyev popped in to congratulate the winning alliance in English and Russian. “I’m very glad that our teams joined together to win this championship. It’s very important for our relationship. I’m so proud for our countries and our teams,” he said. Now that the middle schoolers are done, the high schoolers get their turn! Zero Robotics runs its high school tournament during the fall semester, concluding in January with the High School Finals on the ISS. For the high schoolers who compete in Zero Robotics year after year, back to school means back to space! Free registration is now open for the Zero Robotics high school program. The deadline is September 26, but teams are encouraged to register earlier so they’ll have more time to prepare code for the 2D Practice Competition on September 28.